This might be the last post in what's turned out to be a mini series on how to use scales. This one's about scale avoidance or as I'm calling it, "gravitaphobia". Gravitaphobia tends to happen when folks who believe weight management involves strict control (often to the exclusion of using food for pleasure or comfort) have a difficult time (go figure) living their overly strict lifestyles and then consequently indulge. Suddenly the scale that they had been stepping on multiple times daily due to their scale addiction - suddenly they want nothing to do with it. Going into the bathroom many will even avert their eyes rather than glance in its direction. Certainly they didn't consume enough calories to make a dent. A piece of chocolate cake, even a rich piece, probably doesn't even contain a quarter pound of calories, yet it's often enough to trigger gravitaphobia. For some gravitaphobia lasts a day or two. Others it can be weeks and some months or years, and often scale avoidance goes hand in hand with giving up on many or all healthy living strategies. If you're trying to lose weight - weigh weekly. 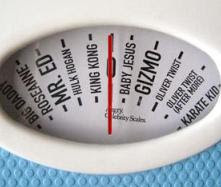 If you're trying to maintain your weight - weigh daily. But either way, never ever let the scale push you around and remember that life is dynamic and so too is your weight and your healthy living efforts. Sometimes life is worth more calories. Sometimes it just happens that way and sometimes it's for great reasons, but at no time should you let that scale have the power to push you around. Don't spend your emotional energies on overt avoidance or guilt - they're certainly not going to help you any they might even hurt.